I was pretty sure I wrote this post last year. Or maybe the year before. But maybe not. Because I searched my posts, and unless I did a Christmas in July special, I can't find it. So if someone else gets deja vu from reading this, help me out, okay? And yes I know, I've missed a few posts lately. I swear every year I'm going to start holiday stuff in August, and every December I'm running around in circles with lists of my lists that I need to complete. Every. Year. This year seems particularly bad, because even my Christmas cards are late!! Yes, I know I usually send them out before Thanksgiving, but like I said, this year is a bit hectic. As illustrated by Tom and my desperate conversation this morning trying to figure out when we can get Penny serviced. We've been saying for two months now that she should get an oil change before we drive to VT next, but suddenly we're running out of days. Poor Penny, we'll get to it eventually. Along with the vacuum I've been promising ever since transporting our Christmas greenery home... needles everywhere!! Anyway, it is officially Christmas season. We are less than 10 days away at this point, and that means it's prime time for Christmas parties. Tom had one last Thursday night, I had one last night, and I have another one next Thursday. That's right, one party is not enough for my office. We require two, or it's not really Christmas. Last nights party was THE BIG ONE. There was a dance floor and DJ, multiple food stations with food from all over the world, games, competitions, candy bars (as in a bar where you fill bags with candy to take home), you name it, it's there. There's even an indoor snow machine like the TSO concerts have. (Which now that I think of it, I still haven't written a post about!) We even spotted our company's favorite emeritus employee walking around. The only disappointing thing about this year's party was the lack of ice cream sundae bar! Every year this is my favorite part, and all night people knew I was waiting for it. And then at the end of the night... nothing! It never came out, leaving one disappointed Caitlin! But one of our all time favorite things about these parties, that was still there, is the photo booth. Every year it's a requirement to get a group photo at the end of the night with whoever still happens to be around. For a few years there was some concern that the photos were cursed, because it seemed like by the next Christmas party, at least one person in the previous picture would no longer be working at the company. However someone declared it officially broken this year, so this was the first year we haven't grabbed a random coworker to be in our picture as a precaution. But as I was looking at last nights photo this morning, I realized that I have at least ten years of photos, and it's kind of cool to look at how everyone has changed over time. This was this year's photo. The three guys in suits have been with me since the day I started. I actually interviewed with two of them back in February 2005, and I've reported directly to all three of them. Two of them are actually in each of the holiday pictures I have. I'm not the only one who has grown up a bit in the past 12 years haha. 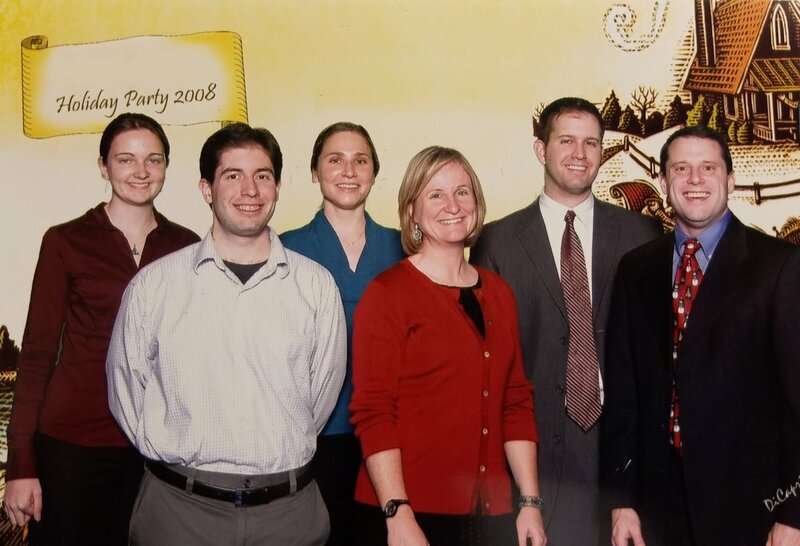 See what we looked like in 2006? Can you find us in the rest of the photos below? (Click on photos to enlarge) One of my coworkers commented that I looked super young until I came back from my 2 years where I worked at another company. Apparently they weren't only stressful, but they aged me too! Another year in the books! Here's to the next one!